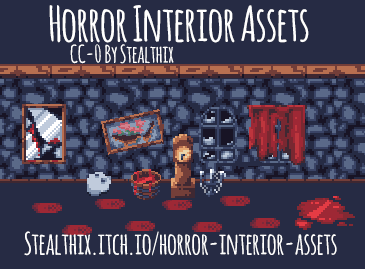 18 different horror themed sprites. Each of them is drawn by hand and is exported on one spritesheet with transparent background. I've used the Endesga 32 Palette to create these. The wall in the background is part of my free dungeon tileset. YES! I have been hunting for a good looking 32x32 3/4 overhead view mirror tile for so long. Thanks! :) Any chance of an unbroken mirror version as well? These were fun, I made it when you kill an enemy they turn into a bloody pool and you can walk over it and leave bloody foot prints behind. SO thanks for this, it was really funny.